There are many excellent wedding venues in Phuket. Choose from grand resorts with manmade lagoons and elaborate pools and fountains, or blooming gardens of bright tropical flowers that fill the breeze with their inviting aromas. 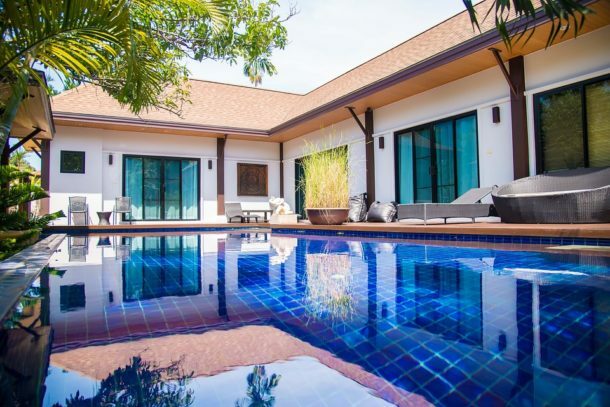 Rent one of Thailand’s famous open air beach villas and take maximum advantage of the perfect weather 24-hours a day. Some have ocean views, while others boast personal infinity pools overlooking the terraced rice fields. There are sprawling luxury estates, intimate rooftops, coconut groves, scenic restaurants and private yachts all available to host your Phuket wedding celebrations. Throughout your events, help your guests experience Thai culture by incorporating some of its traditions like a Thai monk blessing over your marriage or the Thai Water Ceremony, a version of the most sacred part of a Buddhist wedding ceremony, shared with you and your guests to forever connect you with the paradise where you were married. Your guests can participate in this ritual with you by each pouring some of the blessed water over your hands from a beautiful conch shell while offering you a piece of advice, or a personal blessing. Add local flavor and fresh ingredients like coconuts, pineapple, bananas, cashews and seafood to your event menus to further infuse the Thai culture into your dream Phuket wedding. Treat your guests to professional regional entertainment like fire dancers or a troupe of Thai classical dancers. We can also help you secure the best international DJ and live musicians for an amazing dance party worthy of Phuket’s reputation for exciting nightlife. As a grand finale, end your wedding in Phuket with a moving display of sparkling fireworks or the romance of floating lanterns. How can we help you personalize your dream wedding? Our team of international wedding planners are award-winning and experienced at crafting whole wedding weekends to engage your guests, share your story and thread your own background and culture throughout your custom Phuket destination wedding.